“I don’t understand the poor. And they’re constantly turning out more. disgorging its young by the score. say the pickpocket, beggar or whore. From what I can tell they do quite well. They’re rising above; and it’s work they love. A full-page ad appeared in the NY Times Sunday Arts & Leisure section. The Edwardian-period graphics perfectly create a zany sense of anticipation for the show! This highly entertaining show, which was a runaway-hit at the Hartford Stage and at San Diego’s Old Globe Theatre, focuses on a penniless English commoner, one Montague (Monty) Navarro (Bryce Pinkham). Through a fateful meeting with a good friend of his recently deceased mother he discovers that he is number nine in line to inherit the wealth, power and prestige of the Earldom of Highhurst. A review influenced by the language of social-media shorthand. Calculating that his chances of outliving all eight of his D’Ysquith relatives, all portrayed hilariously by Tony-Award winner Jefferson Mays, are slim, he stumbles onto a helpful idea; it would be more expedient to bump off all those ahead of him in the line of succession. This witty music hall-styled comedy poses the question, how low Monty will stoop to reach the top of the Edwardian social heap? The façade of the Walter Kerr Theater proudly announces its current production. That explains the murder part of the title. As for the love part, Monty keeps a mistress, his now-married, old flame, Sibella Hallward (Lisa O’Hare), at the same time he courts his comely young cousin, Phoebe D’Ysquith (Lauren Worsham). Love and murder are short words, attracting attention that easily fit a title. They describe the plot; but the story is about revenge. Monty is motivated by a wish to see his D’Ysquith relations pay for their mistreatment of his dear, departed mother. She was a D’Ysquith who was cast aside by her family because she married a musician for love. One melodramatic device is layered upon another in the most delightful ways. I really believe this musical deserves this honor. 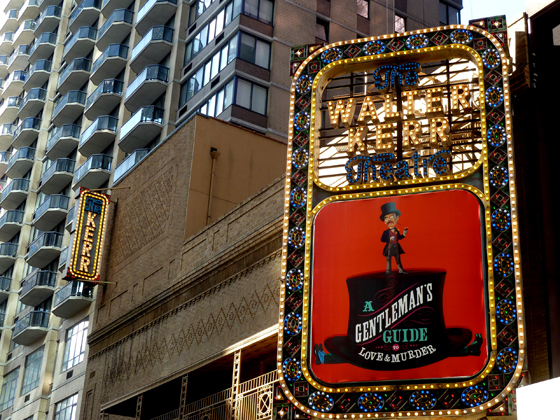 “A Gentleman’s Guide to Love and Murder” has earned ten 2014 Tony Nominations, including Best Performance by an Actor in a Leading Role in a Musical for its leading man, Jefferson Mays, and the much-sought-after Best Musical nomination! It deserves to win in all nominated categories. I would see it again, and maybe a third time. It is that good! The stage set for “A Gentleman’s Guide to Love and Murder” has a musical-hall look to it. This entire production, directed by Darko Tresnjak, is too clever by halves, including the staging and scenery. One detail that I noticed about the scenery. Roll-up canvases from an authentic music-hall production of the late 19th and early 20th century could easily replace the modern use of video-screen scenes as backdrop. This delightful show returns to Broadway a lost art form: musicals that match memorable melody with effervescent and witty turns-of-phrase. I loved every minute of this frisky romp; it was an entertaining way to spend several hours in the theater. Opalescent light fixtures give the Walter Kerr Theater a period look. The Walter Kerr Theater, named for the Pulitzer-Prize winning drama critic for the New York Times, was called the Ritz Theater before it was renamed in 1990. Built in 1921, it has undergone several renovations by its current owners, Jujamcyn Theaters. Among the more recent productions that have been staged here were the Tony Award and Pulitzer-Prize winning “Clybourne Park”; the Tony Award-winning “Love! Valor! Compassion!”; and “Angels in America.” Between 1944 and 1970 the theater was used as a radio and then a TV studio by NBC and ABC. In the 1970s and 1980s the theater was known as Robert Kennedy’s Children’s Theater.